The 4th Annual QQII will take place on Saturday, October 27th, 2018. To ensure that the trails do not become overcrowded, the QQII field is limited to 500 registrants. Register today! October 15th Note - We have added an additional 25 spots/1 additional wave to the 2018 event. The 2018 field is limited to 525 participants. Saturday, October 27th, 2018. The first wave starts at 9:00am. All start times will be listed here on race week. Cuivre River State Park is located in Troy, Missouri. Runners are sent onto the race course in waves of 25 that have been seeded according to their predicted pace for a road 10K. 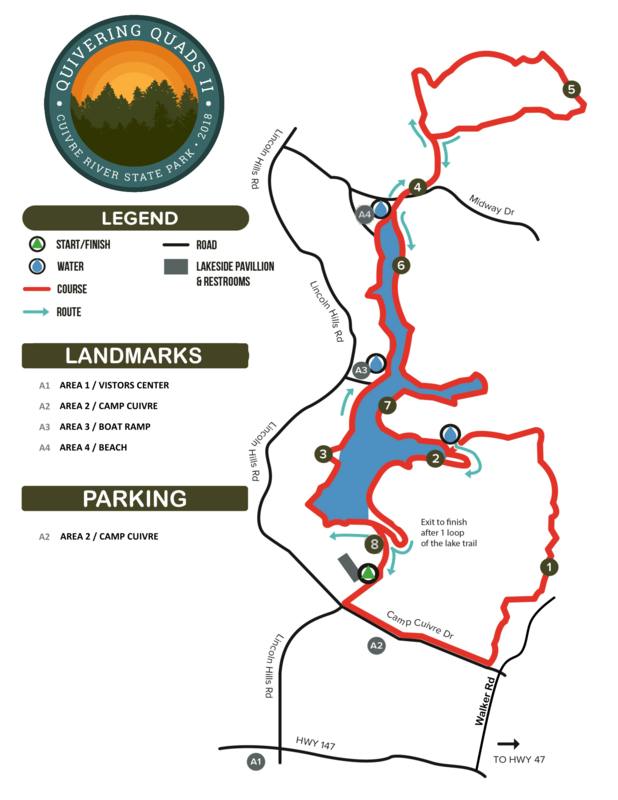 The 2018 event features a 8.14-mile course that incorporates completely different trails from the original Quivering Quads (March event) and will take runners through some of the most picturesque areas of the park. The course will begin and finish near race headquarters at the beautiful stone lakeside pavilion. Heading out on the course in waves of 25, participants can expect rolling dirt hills, mixed with rocky patches, great scenic views from all angles around the lake and open fields with tall grass, before heading back into the woods. The course offers new challenges for every level; competitive runners can let loose and move into a flow around twists and turns without having to worry about difficult climbs. Novice runners will get a taste of a semi-fast course while enjoying awesome scenery. Beginners can enjoy striking views along the entire course that will remind you of the Ozarks, with some challenging footing and questions along the way to keep you on your toes! If you are coming from out of town and cannot pick up your packet until race morning, please download and carefully read the Race Instructions before race morning. Your race swag and race number will be waiting for you at the race start beginning at 8am. Registration - The 2018 event is sold out. To avoid overcrowding the trail, registration is limited to the first 525 entrants. Entry fees include a $3 fee charged by the Missouri Department of Natural Resources. Participants can choose between a custom BOCO backpack or a vintage thermal long sleeve shirt. Want both items? Purchase the custom QQII backpack for the discount rate of $16 thru 8/26. After 8/26, the backpack will increase to $20. (regularly $35). BOCO Backpack: a custom lightweight bag that is designed as a day pack with a quick cinch closure on top and a wide-open one compartment. The bag has two mesh panels in the front which allows for airflow and 2 side mesh pockets to hold a water bottle or personal items. Inside the large opening, there is a small pocket to hold a hotel card key, credit card, and key. Very versatile use for race gear, shoes, towel or swimsuit. Adjustable straps for comfort and fit. Machine washable. Register through 9/14 to be guaranteed your backpack. Vintage Thermal Long Sleeve Shirt: An incredibly soft and relaxed unisex style, this vintage thermal long sleeve shirt features acid washed dark smoked color. There's a good chance this will be the softest shirt you will own. The 60%/40% cotton/polyester burnout fabric has a super-soft vintage feel. It's fit is standard unisex sizing. Consult the sizing chart to get the best fit. All entrants who register through October 12th will be guaranteed a QQII sweatshirt (Late registrants will receive sweatshirt if available.). All finishers will receive a custom finisher medal. Awards will be awarded to the top three overall finishers and the top three in ten year age groups. Complete Race Details | Click here to download the complete Race Instructions. New to the 2018 QQII event, THE GREAT PUMPKIN CONTEST! Pumpkins are the epitome of Fall and Halloween, so let’s decorate our event with your creations. The contest consists of having participants (You!) decorate, paint, or carve a pumpkin to the design of your choosing. Then on race day, bring your masterpiece with you to display for all to see. Racers and spectators will cast their vote for their favorite and prizes will be awarded to the top 3 pumpkins. Contest is free to enter but registration is required. Register here and get started creating your Great Pumpkin! Interested in volunteering? Volunteer at QQII and receive a custom BOCO backpack and pair of Balega socks! We are looking for individuals and groups to help with packet pick-up, course marshaling, pre/post race, water stations and much more. Email Jules for more information or to sign up to help! Please review the Race Instructions or email Jules. QQ was endorsed in 2014 by Outside Magazine, which named it one of the six best Outside running races. We're confident QQII will live up to QQ's great reputation. In 1994, Fleet Feet Sports hosted the inaugural Quivering Quads Trail Runs along the beautiful single track trails of Cuivre River State Park. The unique event incorporated race distances of 10 kilometers, 13.1 miles, 50 kilometers and 50 miles. 175 runners entered the inaugural event, which immediately became a fixture on the St. Louis area’s running calendar. In the late 90s, QQ was the largest trail run in Missouri and an event of some national prominence. The race was regularly featured in Ultrarunning Magazine and earned mention in Kirk Johnson’s 2001 book To the Edge, which documented the world of ultramarathoning. The race went into hiatus after 2003’s 10th annual event so Fleet Feet could attend to the growth of their Lewis & Clark Marathon and Half Marathon, which has now become Rock ‘n’ Roll St. Louis, and the Race Directors could attend to the growth of their kids. In 2010, QQ returned as the Quivering Quads Trail Half Marathon. QQ continues to take place every March.